Labeled an outcast by his brainy family, and a bouncer overcomes long odds to lead a team of underperforming misfits, beating the crap out of everything that stands in his way. Use arrow keys to move. Hit Z for Light Punch, X for Light Kick, A for Heavy Punch or to Skip Cutscenes, and S for Heavy Kick. Press P for pause and O for Options Menu. Now get out there and fight for your team. Goon is a fighting game on www.bestgames.pk. Get ready to spend the day with two cute sea babies: Baby Ariel and Baby Lagoona Blue are in the house with a super entertaining baby caring challenge prepared for you! Come and join in getting the new baby game for girls started, meet the two water loves and work out your baby caring skills while taking care of these sweet bundles of joy. First of all, select one baby to spoil today and then fulfill the given tasks one by one: wake her up, spoil your baby with a delicate body massage, feed her with a delicious slice of cake, feed her fish pet, too and then send your baby sailing on a friendly shark! Great job, ladies! Now guess what? Now go to the next page of the game and choose a really chic dress and the right accessories to style up your cute little baby. Still can’t decide who is the cutest baby in our newest baby care game? Then why don’t you take the time to take care of them both? 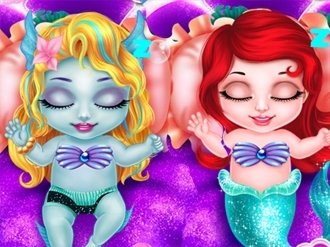 Have a great time, ladies, playing the ‘Sea Babies: Ariel X Lagoona’ game for girls!